I first heard about this lens several months ago from NikonRumors.com which has been fairly reliable for early news unless I hear it from a manufacturer like I usually do with Zeiss. I don’t have a very deep relationship with Tokina so I had to wait like everyone else to confirm this new zoom. The focal length intrigued me since it picked up right where the 11-16mm left off. As many of you know, I love the 11-16mm. It’s not the end-all-be-all of wide zooms, but the price for performance ratio is simply unbeatable. With the next lens in the lineup Tokina made a few improvements, but not without sacrifice. The 16-28mm is now an FX format lens which means that it covers a 35mm full frame sensor. Excellent for me and my Nikon D700, but even more important, it would work well with a Canon 5D mkII or the upcoming RED FF35 sensor. 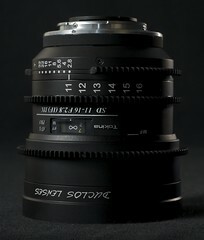 side view of the new miniature pro zoom from Tokina. 16-28mm f/2.8 FX. Manual 11-16mm with Nikon F mount. With the success of the PL mount manual 11-16mm, I decided to explore other options. It seems that there aren’t many good candidates for cine conversion out there. We made a hand full of PL mount Nikon 80-200mm lenses with the usual bells and whistles. But nothing that could keep up with our Tokina conversion. Along the way I learned that many people had switched from PL to the Nikon mount on their RED camera to save money on glass. This is great because we also customize the Zeiss ZF lenses that are Nikon mount, but it left our available lens lineup a bit confused in regards to mounting options. Many of our potential 11-16mm customers had already switched to Nikon mount, making our PL lens useless. I thought it would be great if I could offer a Nikon F mount version to those who still loved their Nikon glass and didn’t want to switch mounts frequently. The 11-16mm Tokina comes from the factory in a Nikon mount, but there is still no aperture control. With the complete cine-conversion, the aperture is activated and all the controls are manual, but now with a Nikon F mount. Perfect! Posted on October 27, 2009 November 21, 2009 Author Matthew DuclosCategories UncategorizedTags 11-16mm, nikon, RED, Tokina3 Comments on Manual 11-16mm with Nikon F mount.